While it is still cold out now it’s not too early to start thinking about prepping your yard for gardening! It doesn’t matter if you want to do fruits, vegetables or both they will add curb appeal to your home! Typically, in Massachusetts, the last frost date falls somewhere in June and can range when but it’s safe to assume you’ll see the last frost in the first two weeks. Knowing the type of seed to plant for the soil, weather and season is step one to having a flourishing garden in the warmer months. Onions, peas, and spinach can all be planted once the ground is able to be dug up. Cool season seeds (seeds to plant before the last frost) are cabbage, broccoli, lettuce, beets, carrots, celery, kale, and potatoes. It’s best to wait until after the last frost date for beans, corn, cucumbers, tomatoes, peppers, and eggplant. If you are worried about a late frost using a cloche to help protect your seeds is a great option! Cloches act like mini greenhouses and trap the heat in. This will keep the soil warm enough where the seeds have been planted. People with gardens from the previous year can use these to cover plants if they start to grow too early and there are colder temps in the forecast. Choose a spot that receives direct sunlight all day and is a big enough plot to house the seeds you plan to get. You may also need to choose a spot with half day sunlight and then the minimal sun for plants that require more shade. Most seed packets or plants come with a little info tag that explains how much sunlight and water they need a day along with how tall and wide they should grow. For example, broccoli should be planted anywhere from 12 inches to 24 inches apart from each other but green beans only need a couple of inches of room! Once you decide where you want to plant. Start clearing that area. Rake up all extra leaves, grass cuttings, and any debris from the winter. Remove dead branches and plants from the previous year and then start prepping the soil. Weeds can be a problem if left alone. Pulling weeds up, making sure you have the full root before they flower and can reproduce is an effective way to get them to stop. Once you have planted a few plants and they are blooming tossing down a layer of mulch will help prevent other weeds from growing. Prepping the soil is also crucial for healthy plant growth. 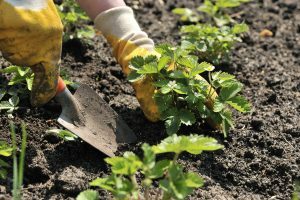 Loosening it and turning it over with a shovel helps with plant growth, allowing the roots to grow more easily once they are planted. Mixing in some fertilizer to new areas is highly recommended as well as mixing a little into older areas to help keep the soil nutrient-rich for your plants! Flower, vegetable and fruit gardens can help prep your home for a spring sale! All types of gardens will help increase the curb appeal of your home and help you sell for more when done right! A low maintenance alternative to vegetables and fruits is wildflowers! Choosing a northeast wildflowers garden mix seed for your flower bed is easy, most garden stores and places like Lowes and Home Depot sell this seed for cheap! Wildflowers will grow in many colors and will continue to grow back from year to year. The most these seeds need once planted is water twice a week for the first few weeks, you’ll most likely get lucky with it raining at least once a week in the spring! Then water as needed depending on how dry and hot the weather is. These flowers will bloom around late May or early June and will stay around until late September or early October weather depending. A low maintenance landscaping miracle! Gardening can be a great stress relief and a good way to spend more time outside in the warmer months! Save money at the grocery store and plant your own fresh vegetables and fruits!